Annie Russell is a comedian and editor at WBEZ in Chicago. She is an experienced public radio editor, reporter and producer. 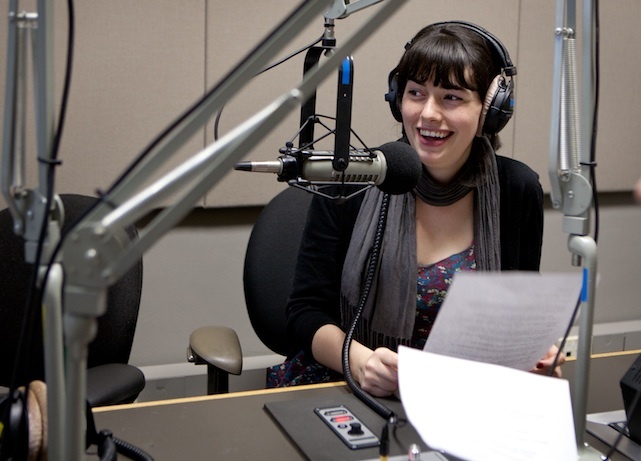 She’s worked on a variety of comedy podcasts, news stories and public radio projects. She was previously deputy news director at Vermont Public Radio and host of The Pub, a podcast about public media for Current.org. In past lives she’s worked as a freelance podcast producer, live sound engineer, music writer, social worker, music director, and video store clerk. She is a graduate of Columbia Journalism School. She was a recipient of AIR’s 2017 Better Edit Fellowship. She performs stand-up comedy all over the U.S. She’s opened for Marc Maron on the “Too Real Tour” and Al Madrigal at the University of Vermont. She’s been featured in the Boston Comedy Festival, Women in Comedy Festival, North Carolina Comedy Festival, Floodwater Comedy Festival, Motor City Comedy Festival, Boston Comedy Arts Festival, Cream City Comedy Festival, Waking Windows Festival, Tower City Comedy Festival and the Green Mountain Comedy Festival. She was a 2015 and 2017 finalist for Seven Days’ ‘Best Stand-Up Comic,’ a reader’s choice award.